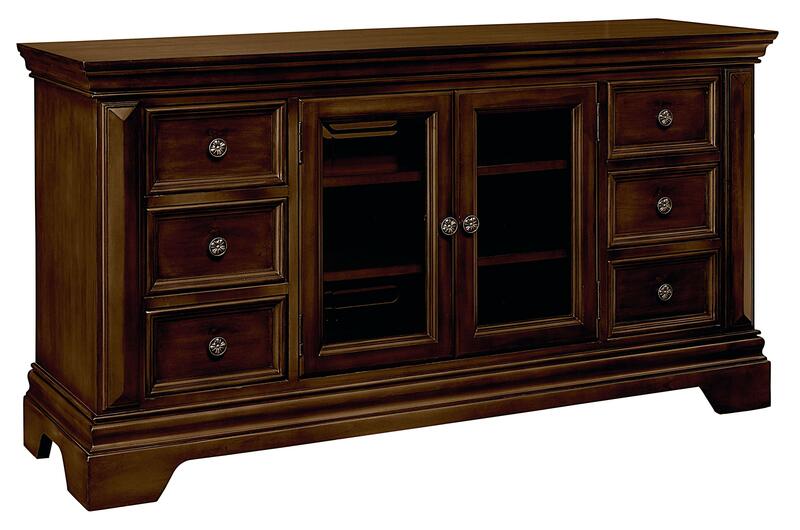 This entertainment will be a great addition to your traditional style living room. Display your devices on three shelves behind two glass doors, and store your media in six drawers. This table has a very elegant look to it with crown moldings, burnished tobacco brown finish and aged metal hardware, and it is a great place to set your television. The Charleston Traditional 60" Entertainment Console with Crown Molding by Standard Furniture at Furniture Fair - North Carolina in the Jacksonville, Greenville, Goldsboro, New Bern, Rocky Mount, Wilmington NC area. Product availability may vary. Contact us for the most current availability on this product. Drawer / Shelf Construction French Front Dovetail Drawers with Stained Interiors and Felt-Lined Top Drawers. This traditional collection will enrich your living room and dining room. 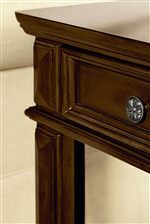 Crown molding, burnished tobacco brown finish and block feet give these pieces an elegant and sophisticated look. Subtle details like raised bead drawer frames, aged metal hardware and beveled overlays add dimension to the collection. 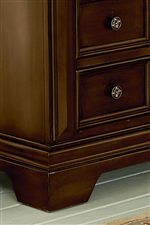 The Charleston collection is a great option if you are looking for Traditional furniture in the Jacksonville, Greenville, Goldsboro, New Bern, Rocky Mount, Wilmington NC area. Browse other items in the Charleston collection from Furniture Fair - North Carolina in the Jacksonville, Greenville, Goldsboro, New Bern, Rocky Mount, Wilmington NC area.